Amazon has finally announced it will be bringing the Kindle to international shores rather than just the US, meaning the UK will finally be getting its hands on the ebook reader. However, it's only the first version of the device, with the Kindle DX still seemingly far off for us Brits. The price of the ebook reader is still bizarrely in dollars, so those who want the Kindle desperately will have to pay $279 (£175) as well as handling charges of $20.98 (£13.10) and an import deposit of $45 (£28), meaning a cost of £216 to get the UK version. Those that choose to pay the premium will see their Kindle shipped on October 19, according to Amazon. However, the online retailer has pledged a UK version of the Kindle launch page, so the price will likely change when it becomes available in sterling. Amazon has signed up a number of international newspapers for the international launch, with the UK's The Times, The Daily Telegraph and the Daily Mail all represented for in downloadable content. "We have millions of customers in countries all over the world who read English-language books," said Jeff Bezos, Amazon's CEO. "Kindle enables these customers to think of a book and download it wirelessly in less than 60 seconds." The online store is promising "many more books from UK publishers in the coming weeks and months" to supplement the 250,000 English language titles already available. 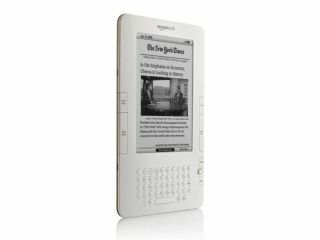 Sony has stolen a march on its rival by releasing a number of variants of the Reader, its own ebook platform, including the new Touch and Pocket, although neither of these pack 3G. It's also unknown which UK network will be handling the data transfer for the Kindle, with reports that negotiations with operators were dragging on as Amazon tried to find a suitable host.